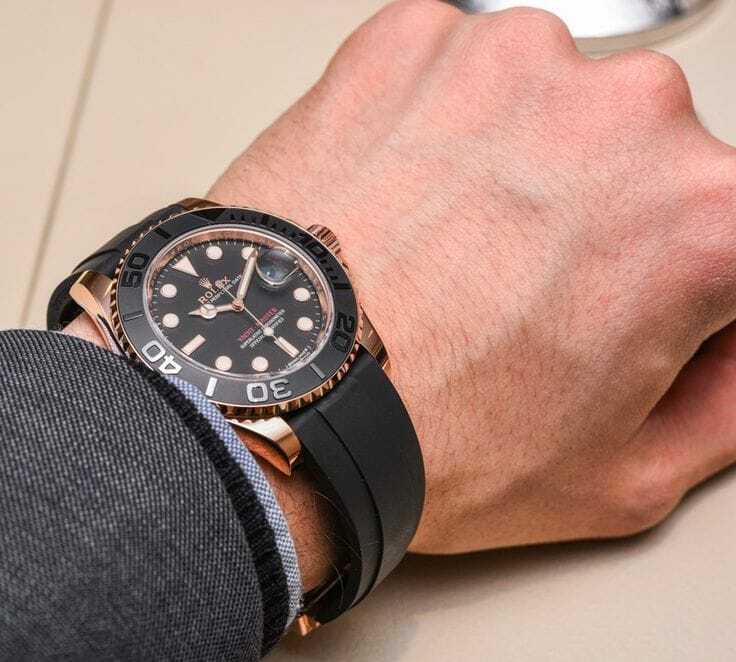 Bold, striking, robust are some of the few adjectives that come to mind when looking at the latest Rolex Yacht-Masters unveiled at this year’s Baselworld. 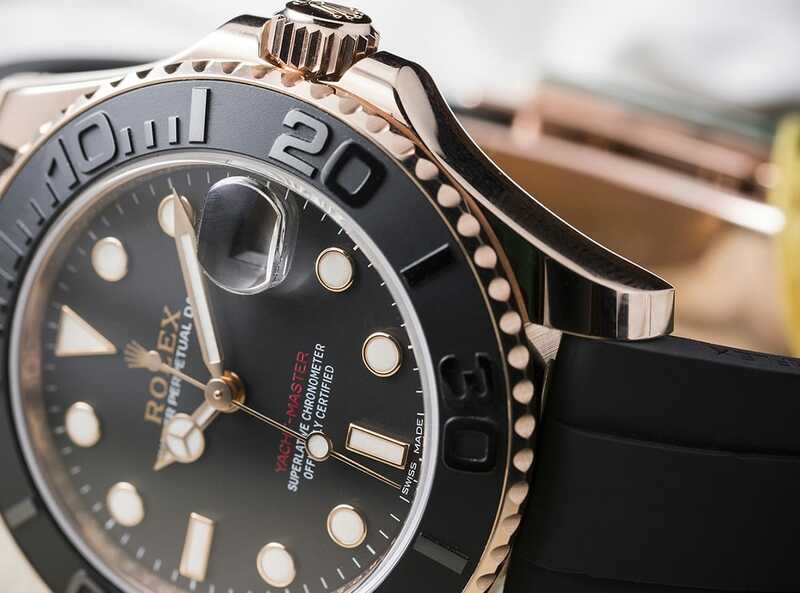 Aesthetically the two latest members of the Yacht-Master family may seem dramatically different from the original models within the collection, but upon closer inspection, we see that Rolex has cleverly taken the original characteristics of the Yacht-Master and steered them into more modern waters. The bidirectional rotating bezel used to record elapsed sailing times found on all Yacht-Masters has now been furnished with a Cerachrom insert in matte black ceramic with highly polished raised numbers also in black. The monochrome bezel with contrasting textures of matte background and shiny numerals not only lends a contemporary style, but also from a functional standpoint, it allows the wearer to easily see elapsed times of up to 60 minutes. The dials of the two new Yacht-Masters feature all the usual suspects of large hour markers and hands for optimal readability, yet it sits upon a black dial, which hasn’t been seen in this collection before. 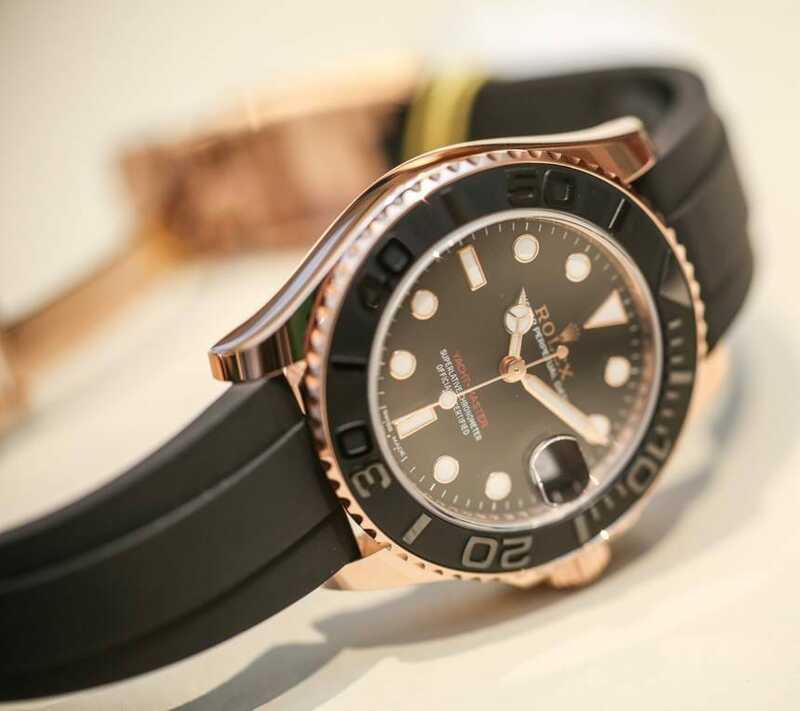 Contrasting with the black bezel and black dial is the 18k Everose gold Oyster case, waterproof to 330 feet deep and its winding crown is naturally equipped with the Rolex Triplock triple waterproofness system. The case of the Yacht-Master Ref. 116655 is 40mm, while the case of the Ref. 268655 is a smaller version at 37mm and each boast a different movement within their cases – Caliber 3135 and Caliber 2236 respectively. The juxtaposition of black ceramic and Everose gold produces an arresting look that is at its heart sporty, yet ultra luxurious. Debuting on the new Yacht-Masters is the brand new Oysterflex bracelet. 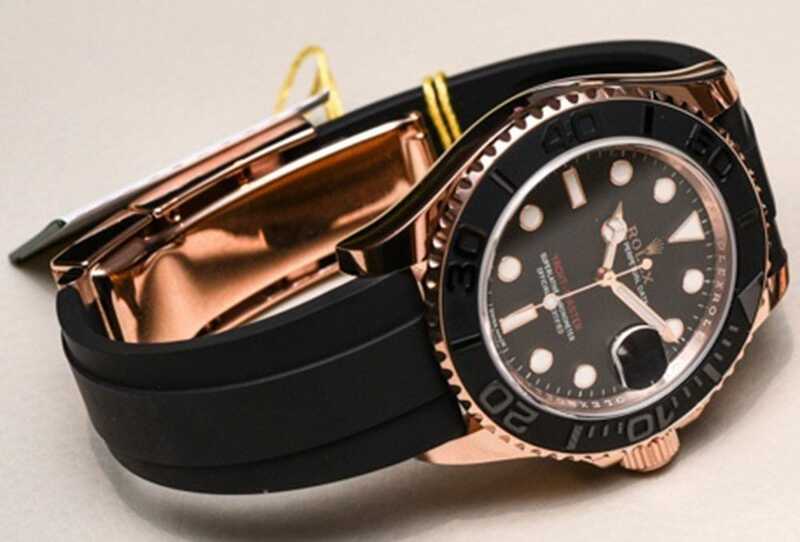 It may look like rubber to the unknowing, however, this being Rolex, it is not a rubber strap. The Rolex developed and patented Oysterflex is an ingenious mélange of the strength of a metal bracelet with the comfort of a rubber strap. Its construction includes a nickel alloy metal blade that is encased with black elastomer – a material highly resistant to external elements – and features a patented cushion system on the underside of the strap that keeps the watch comfortably in place on the wrist. Finishing off the bracelet is an 18k Everose gold Oysterlock safety clasp to ensure the watch remains where it’s supposed to be. While the new Oysterflex is currently only found on the latest editions of the Yacht-Masters, it’s pretty safe to say that the new innovative straps will make future appearances on other Rolex watches. So, whether you’re out competing in a sailing event or just taking a leisurely cruise aboard your boat, the new Yacht-Master models from Rolex are the perfect nautical companions.